NAMM 2017: You probably know G7th as the company behind the premium Performance 2 capo, but its latest offering is being touted as its lightest, brightest capo to date. Weighing a mere 8 grams, the UltraLight uses next-generation composite technology that promises not to weigh down guitar necks or interfere with guitarists' fretting hands. 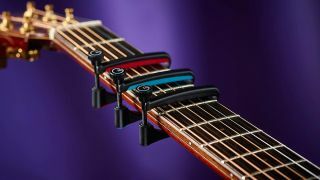 The UltraLight capo works with both acoustic and electric steel-strings, and comes in snazzy black, red and blue finishes, too. It's available now for around £10. Head over to G7th for more details.